Donald Trump spent the past two years attacking rival Hillary Clinton as crooked, corrupt, and weak. But some of those attacks seem to have already slipped into the history books. From installing Wall Street executives in his Cabinet to avoiding news conferences, the president-elect is adopting some of the same behavior for which he criticized Clinton during their fiery presidential campaign. Now: A number of former employees of the Wall Street bank will pay a key role in crafting Trump’s economic policy. He’s tapped Goldman Sachs president Gary Cohn to lead the White House National Economic Council. Steven Mnuchin, the Treasury secretary nominee, spent 17 years working at Goldman Sachs and Steve Bannon, Trump’s chief strategist and senior counselor, started his career as an investment banker at the firm. Trump is following in a long political tradition, though one he derided on the campaign trail: If Cohn accepts the nomination, he’ll be the third Goldman executive to run the NEC. Then: “Crooked Hillary. Look, can you imagine another four years of the Clintons? Seriously. It’s time to move on. And she’s totally controlled by Wall Street and all these people that gave her millions,” Trump said at a May rally in Lynden, Washington. Now: Trump has stocked his Cabinet with six top donors — far more than any recent White House. “I want people that made a fortune. 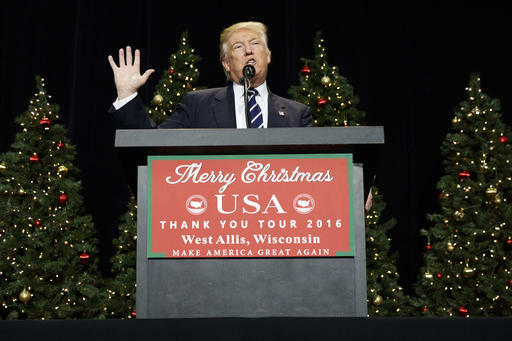 Because now they’re negotiating with you, OK?” Trump said, in a December 9 speech in Des Moines. The biggest giver? Linda McMahon, incoming small business administrator, gave $7.5 million to a super PAC backing Trump, more than a third of the money collected by the political action committee. He hasn’t held one since. Trump skipped the news conference a president-elect typically gives after winning the White House. Instead, he released a YouTube video of under three minutes. He also recently abruptly canceled plans to hold his first post-election news conference, opting instead to describe his plans for managing his businesses in tweets. “I will hold a press conference in the near future to discuss the business, Cabinet picks and all other topics of interest. Busy times!” he tweeted in mid-December. Then: “It is impossible to figure out where the Clinton Foundation ends and the State Department begins. It is now abundantly clear that the Clintons set up a business to profit from public office. They sold access and specific actions by and really for I guess the making of large amounts of money,” Trump said at an August rally in Austin. Now: While Trump has promised to separate himself from his businesses, there is plenty of overlap between his enterprises and his immediate family. His companies will be run by his sons, Donald Jr and Eric. And his daughter, Ivanka, and son-in-law, Jared Kushner, have joined Trump at a number of meetings with world leaders of countries where the family has financial interests. In a financial disclosure he was required to file during the campaign, Trump listed stakes in about 500 companies in at least 25 countries. Ivanka is also auctioning off a private coffee meeting with her to benefit her brother’s foundation. The meeting is valued at $50,000, with the current top bid coming in at $25,000. “United States Secret Service will be Present for the Duration of the Experience,” warns the auction site. Trump on Saturday said he would dissolve his charitable foundation amid efforts to eliminate any conflicts of interest before he takes office next month. Then: “If I win, I am going to instruct my attorney general to get a special prosecutor to look into your situation, because there has never been so many lies, so much deception. There has never been anything like it, and we’re going to have a special prosecutor,” Trump said in the October presidential debate, referring to Clinton. Now: Since winning office, Trump has said he has no intention of pushing for an investigation into Clinton’s use of a private email server as secretary of state or the workings of her family foundation. “It’s just not something that I feel very strongly about,” he told the New York Times. Still, education is a good thing, however one may get it. If nothing else, I think the Trump presidency will be educational for many of those who voted for a con man. Pretty much everything Trump attacked Clinton for, he had already done. This is a political strategy for creating false equivalence..